One of the most exclusive animal hunts in the United States happens on a small corner of Alaska on the Bering Sea. On two subarctic islands live herds of a large, prehistoric mammal that roamed the tundra during the last Ice Age. 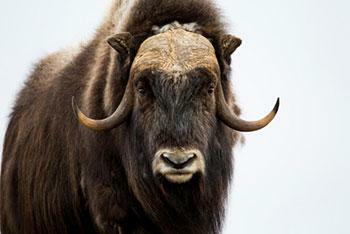 Muskoxen are prized for their fatty, flavorful meat and soft, warm fur. Every year, thousands of people apply online for less than 200 winter permits to hunt them in Alaska. Or, for the truly devoted, you can travel to Bethel to sign up in person. It’s 7:30 a.m. outside the Alaska Department of Fish and Game office in Bethel. It’s dark, above freezing, and a line of vehicles, each holding a couple of men, wait outside. A white jeep has its window down. In a large, blue van next to them lounge two hunters from Fairbanks. The van belongs to the Bethel Evangelical Covenant Church, where London works as a pastor. He offered the van to the hunters to sleep in so they wouldn’t have to pitch a tent in the parking lot. “It’s an outreach [ministry],” London joked. At 7:45 a.m. an ADF&G biologist shows up; the permits open at 8 a.m. Unlocking the door, the biologist announces that the hunters can start chasing him inside. But there’s no need to chase him. The men have already agreed on their order and written it on a ripped-out sheet of notebook paper taped to the door. The paper is referred to as both an “honor system” and “a gentlemen’s agreement.” According to the long-time hunters, this agreement has never been broken. At the Bethel office are two muskox permits for Nelson Island and 10 permits for Nunivak Island. The name on the top of the list, for the only bull permit, is 18-year-old Avery Hoffman of Bethel, who had not left the parking lot in 24 hours. Hoffman has hunted muskox on Nelson Island for years. The young, though experienced, hunter shared pointers with the out-of-towners from Anchorage and Fairbanks as they waited. A few minutes before 8 a.m., another experienced hunter walks in. Tim Bee of Bethel says that he has hunted muskox on Nunivak Island at least 24 times. And for the first time, Bee didn’t need to camp overnight to get his permit. Competition has gone down, and no one from outside Alaska even came this year. Last year, a hunter from New Jersey camped in the parking lot for a week. Of the 12 open slots, five are still available when Bee arrives. Then, without any announcement, ADF&G biologist Patrick Jones begins to hand out the permits. Jones knows all the names by sight. Either he knows them from Bethel, or he met them in the parking lot the day before, so calling out names isn’t necessary. Jones says that the Yukon-Kuskokwim Delta mainland could open a muskox hunt in as little as 10 years if the current population of the animals continues to grow. The Nelson and Nunivak Island muskox permits became available in Bethel on January 15, 2019. A total of 133 Nunivak Island muskox permits were given out this year: 63 draw bull permits online. 10 registration cow permits in Bethel. 60 registration cow permits in Mekoryuk. A total of 50 Nelson Island muskox permits were given out: two bull and two cow draw permits online. One bull and one cow registration permits in Bethel. Twenty-two cows and 22 bull registration permits in Newtok.